Now there is this Wonder Woman sports bra and jogger pants set that are perfect if you like Wonder Woman and working out. Sure this is a workout set but it would work great as a comfy lounge set for at home too. The bra is red with the famous Wonder Woman logo on the front and the jogger pants are blue with yellow cuffs on the bottom and on the blue fabric, you will find white stars and the word Wonder Woman on the side. And all the waistbands and straps also say Wonder Woman on them. 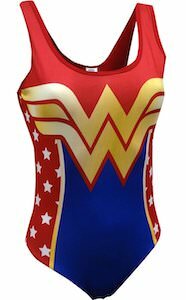 This Wonder Woman workout set is available in women’s sizes Small, Medium, and Large and would just look perfect on you.